Well, since it's been about a year since I have chatted about using cloth diapers, I thought it was time to revisit the topic. Instead of telling you more about the brands/products I use or giving you lots of how-to's, I thought I'd just give you my honest thoughts about them after a full year of using them. Obviously, these are my opinions, but it's what I'd tell you if you were sitting with me and having coffee. 2. It's not as gross as you may think. Okay. Sometimes it is a little gross, but honestly, changing any diaper is a little yucky. Most of time, it's easy to plop the number #2 deposit in the toilet, and that's the end of it. I've never scrubbed it off or had to touch it. Some people are grossed out by the idea of putting dirty diapers into the wash, but we have an effective cleaning routine and have never had an issue with any left-over stuff in the machine. 3. You don't have a huge stash to make it work. We have 12 Charlie Banana diapers, 4 flip diapers, and 12 inserts for the Flip diapers. That's it (and I would totally vouch for both brands!) Many people recommend having 36 diapers (which would be amazing, but I don't think it's necessary). We may wash more often than people with more, but I honestly don't like the idea of cloth diapers sitting too long without getting washed, so it doesn't bother me. I'd tell you to start simple, see what you like, and buy more of what you like. 4. You don't have to love it. *Gasp* Sometimes I don't love using cloth diapers. Sometimes another load of laundry isn't super fun. But! There are more things that I like about them than don't, so I keep at it. But, if you use cloth diapers, and you don't see bubbly hearts around your wet bag and washing machine all the time, don't think that you are alone. I know a number of cloth diapering mommas who think the same way, and yet I know many people who do absolutely adore using cloth diapers. 5. If you stick to it, it will save you money. It really has saved us a lot of money. However, that's because I don't buy new cloth diapers all the time or special products. Even with using disposables 20% of the time, we still only spend about $15 every 4-6 weeks on diapers. Saving money is definitely one of my biggest motivators for sticking to it! 7. You can start whenever you want. Some people start at the beginning, some start when baby is a few months old, others start much later. My theory: don't dismiss using them because you didn't start at the beginning. I know people who started using them on baby number two or three even though they didn't use them before. I know people who started using them when their kid was 1. You can start today if you want. 9. Babies can still get diaper rash. I heard over and over before starting them that using cloth diapers eliminates diaper rash. This has not been true for us. Since wetness stays close to the skin on cloth diapers, you really do need to change their diaper more often. Even so, sometimes Luke has gotten redness that we just slather with coconut oil or other cloth diaper-safe rash stuff. However, he's never had a very severe or bad case, so I think that frequent changing definitely helps. 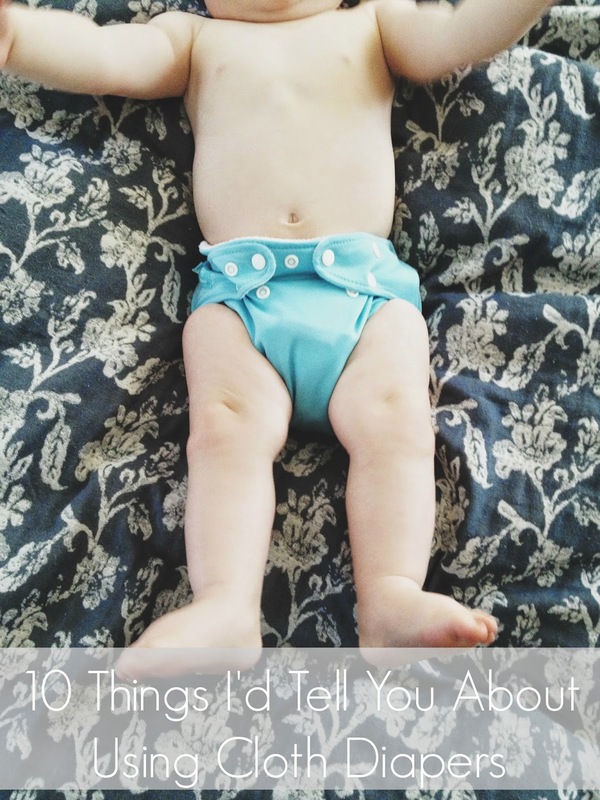 If you use cloth diapers, do you agree with these things? Disagree? If you don't use cloth diapers, would you ever be interested in trying them? If you have any additional questions, I'd be happy to answer them!! Nicole, this article is excellent! It needs to be "out there"! I almost posted it on Pinterest, but I thought it would put pressure or guilt on some sweet young moms in my life. So.......will you post it on Pinterest??? By the way, you are an amazing young woman and mommy! I love you! We are 34 weeks pregnant with our first and plan to cloth diaper! It can be a bit overwhelming when you first start looking into it. However, I feel like now that I kind of know what to do it is not that big of a deal. We got one size diapers so we will use disposables until she is 8 or 10 pounds and can fit the one size pockets. We will also use disposables for longer trips. Thank you so much for sharing your thoughts! these are all fantastic. we've been using cloth diapers because a) diapers are crazy expensive in cambodia, and b) our landlord burns our trash. in our yard. i want to throw up when i think about breathing in diapers every day. that's way more gross than washing diapers in my opinion. our only problem here is that our water is RIDICULOUSLY hard, and the diapers don't absorb as well as they should. they leak a LOT - i'd say at least every other diaper, or every third diaper leaks. and i just accept that's how it is here, and there's not much i can do about it. but i'd much rather spend my money on other things than throwing it away on diapers (literally).